The Lush Chef's little brother was in town visiting and because we were eating out pretty much every night. I wanted to cook for us at least one of those nights so we could save some mula. It was a warm evening and I had a busy day, so I wanted something that wouldn't require me slaving over the stove for a long period of time. I had found a recipe I had ripped out of Bon Appetit about a year ago in my files for Shrimp with Farro and Spring Vegetables, and even though it's summer, there are still plenty of sugar snap peas and asparagus floating around at the market. This recipe makes enough for 4 servings, but my brother had at least 3 of those servings, and mom would be proud that we were getting our veggies. 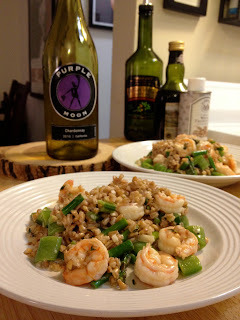 - In a large pot of generously salted boiling water, cook farro for about 8 minutes, or until firm-tender. - Over medium heat, melt butter in the same pot. - Add the shallots and cook until softened (about 2 minutes). - Add the garlic and thyme and cook for about 1 minute more. - Add Chardonnay and increase heat to medium-high. - Add shrimp and cook until they just start to lose their translucency. - Add the peas, asparagus, farro, cream, broth, lemon juice and 1/2 tsp salt. - Stir and continue to cook for 2 minutes more. - Season to taste and continue to cook, if necessary, until sauce is thickened and vegetables are cooked, but still crisp and bright.